Bernanke’s speech can be divided into two main parts. First one reflects on the situation when deflation drives down interest rates near the zero area. Former chairman of the FED brought several experts’ opinion that moving interest rate near zero levels would leave central banks with “no ammo”. In other words, the central bank is going to be left without a tool to stimulate the economy. I want to point out that in the case of monetary policy the government and the central bank cooperates so tightly that they will be used interchangeably. To summarise the first part of Bernanke’s speech, we can conclude that he already had knowledge about the problem of indebtedness growing bigger and bigger on the horizon back in 2002. Most probably he had his own vision of how to solve this problem – one that would take care of the "too big to fail" banks during Ben Bernanke’s term in the FED. In the second part of his address, Bernanke focused on the action plan enabling central banks to keep control over the monetary system. Again, this talk happened back in 2002 and most of this material sounded like a science-fiction to many. His first proposition was to lower the interest rate down to zero. Solution once tried after 2008 economic meltdown. Unprecedented approach as it has never been tried before. Another step would be to increase the scale of central banks acquisitions assuming the ZIRP environment would function well. Today we know this as Quantitative Easing (printing money with which central banks buy government's debt), but this phrase was unknown 14 years ago. The idea turned into reality. Massive purchase started in the US and the rest of the world followed. Particular countries could now borrow at a low rate after the yield of their bonds were artificially suppressed. It was a green light for politicians to go on credit spree – especially when the central bank is giving money away for ‘free’. 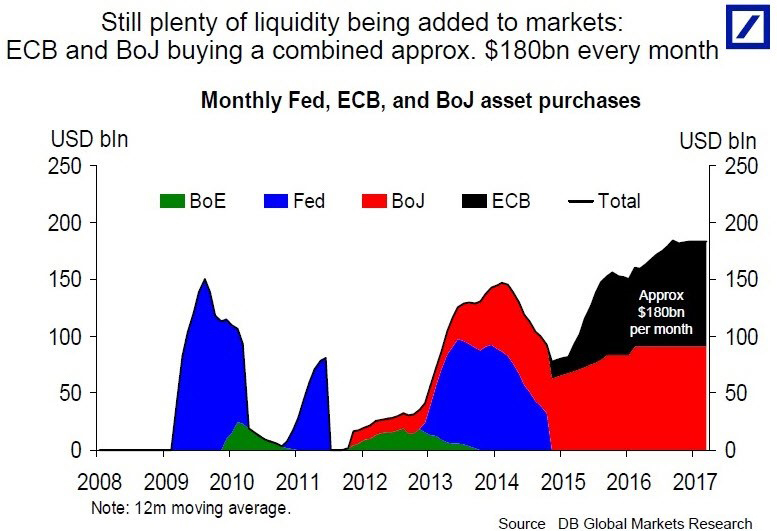 As shown in the chart above, central banks continue their relay of asset acquisition. The FED was leading before, today the ECB and the BOJ are in the front. The policy I present here is far from being a functional, successful solution curing the problem it was designed for. Instead, politicians and bankers gained bigger affluence and influence over the mass of people they govern. Ben Bernanke had numerous suggestions on how to help the economy and each one of them creates an illusion of hard work on the side of politicians without changing a lot for the better. Ben also had an idea to diversify asset classes purchased by central banks. 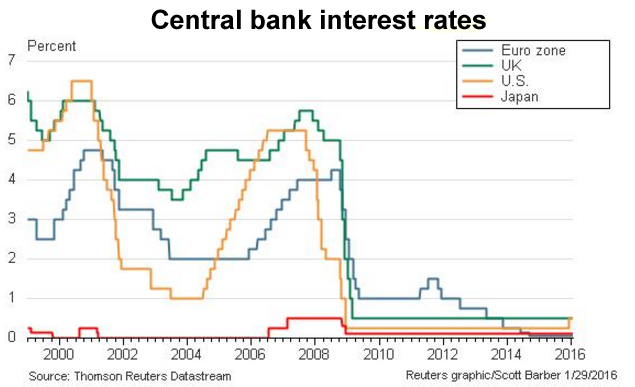 We see now it is very popular among central banks – Japan is a poster child here. The Bank of Japan owns now 60% of all ETFs giving exposure to the Japanese market. American stocks are rising partly thanks to the Swiss National Bank. Ben was a proponent of lowering the Effective Federal Funds Rate down to zero. This rate ascribes the amount banks charge each other when borrowing money – idea used soon after 2008 crisis. Next on Bernanke’s list was for the central bank to enter the debt market – buying MBS (mortgage-based securities). In 2002 the Federal Reserve had no MBS in their portfolio. Later it was the biggest owner of real estate thanks to printing money out of thin air – contrary to average Mr Smith working their whole adult life for a place they can call home. Ben wanted the government to create more debt which would be bought later by the FED. With fresh money, politicians could take over private assets. This is what happened when administration wanted to save AIG, General Motors and Chrysler. Zero Interest Rate Policy – done. Government debt acquisition – done. Effective Federal Funds Rate at zero – done. Debt market interventions – done. Nationalising privately owned assets – done. Now we can ask a question: what is next? Maloney pointed out the part of Bernanke’s speech where a drastic cut of taxes should increase the inflation rate. This would lead to a jump in deficit but as we heard from the President Elect Trump - he wants to cut taxes and unleash a huge infrastructural plan. Will the last point on Bernanke’s list be checked out 15 years after he made his speech? Anything that comes from the mouth of a central banker is aimed at achieving a particular effect. However, this is not the argument against following them because we can learn from them where the financial world is heading to. Bernanke’s speech shows that there is no such scale of intervention the central bankers would not try to secure their control over the monetary system. In case the crowd forgets why central banks exist a reminder - a full-blown crisis - should render appropriate answer obvious. Finally, when Maloney summarised Bernanke’s plan, he highlighted very good perspectives for both gold and silver. Central banks’ strategy of destroying currencies, in fact, strengthens the position of precious metals. Ultimately, gold and silver benefit from the environment of negative real interest rates (when the real rate of inflation is higher than the rate paid on deposits). We have to remember that Mike Maloney is making money by selling precious metals. I would never advise keeping 100% of your capital in gold or silver. Diversification is the key and apart from precious metals you should add commodities and stocks from cheaper developing markets. I have already mentioned Russia, Turkey, Chile and Nigeria but taking a closer look at Singapore and Asia (excluding Japan) is worth your time. To allocate an additional buffer to your portfolio I would advise keeping 20-30% of your portfolio in cash – CHF and commodity currencies. Lastly, getting back to Ben’s speech I want to point out an increasing amount of assets owned by central banks. Maybe in this absurd world of finance, some people should be reminded that the system where everything is controlled and owned by the state is called communism. Italian constitution stays cool, Austria will wait for more anti-globalist authorities and in today's news we have Belgian century bonds taking a dive. All have a nice day! Hi Independent TRader team. I would like to ask if you have any training for an upcoming investor? I am a student of economics but from what I see at the university this sort of education will not give me the right tools to operate in QE-infested world. Can you recommend anything? Please use the 'contact' tab and provide your email and we will get back to you. Your last sentence says it all. I see a guest here "eager2learn" is looking for advice. Unfortunately, how can one profit if financial manipulation is as extreme as it now is UNLESS one is truly a insider who has access to the right info for profitable trades. I'm interested in knowing what the Admin thinks regarding Algo trading within the current highly manipulated financial and investment world - especially as the US and world economy weaken. “The GSEs are adequately capitalized. They are in no danger of failing." Additionally, over the past 30 years, Bernanke will never tell you that the FED has changed the way it calculates inflation more than 20 times. Bernanke is an agent of the Fed and a Wall-Street agent.